Janelle Rodriguez is a belly dance performer, choreographer and musician who has trained in many styles of dance since the age of 5. Based in Santa Cruz, California, Janelle teaches classes and serves as artistic director/choreographer of Desert Dream Dance Company. She also directs Desert Dream Music Ensemble. With Desert Dream Dance Company and as a solo artist, Janelle gives workshops and performs across the US, inspiring audiences with her musical interpretation and creative expression of belly dance. 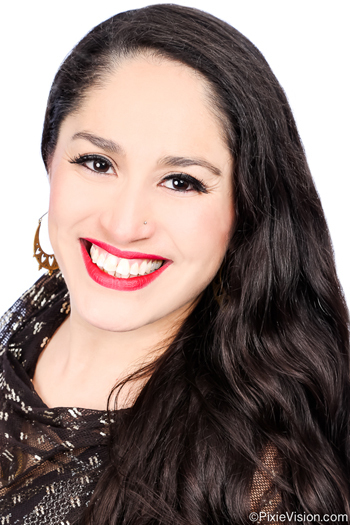 Janelle’s early background includes ballet, jazz, tap, modern dance, gymnastics, hip-hop and Mexican Folklore. In 1995, she began studying Middle Eastern dance with Cory Zamora in Fresno, California. Immediately enamored by the isolated movements and unique rhythms, the dance form felt familiar to Janelle, and thus began her lifelong passion of study and personal growth. Janelle moved to Santa Cruz in 1997 and began studying with Beth Frue, a founding member of Fat Chance Belly Dance. Deeply rooted in modern and classical Arabic dance, Beth’s supportive mentoring motivated Janelle to choreograph and teach a belly dance piece for Cabrillo College’s 1998 spring dance performance. A year later, Desert Dream Dance debuted in Santa Cruz, with a duet performance by Beth and Janelle, followed by student and professional troupe appearances at festivals. Today, Beth’s legacy lives on in Desert Dream Dance Company. Janelle started teaching small classes for friends and fellow dancers in 2002 before buying Pleasure Point Fitness & Dance Center in 2008. In 2015, she found a new home base for dancers and musicians with the opening of Desert Dream Dance Company studio. Understanding muscle use and development plays a primary role in all of Janelle’s classes, which integrate Suhaila and Jamila Salimpour formats. A prominent and respected instructor throughout the San Francisco Bay Area and Central Coast of California, Janelle enjoys sharing her knowledge and love of Middle Eastern and Arabic dance through teaching, which further encourages her to improve and grow in her own dance training and artistry. Pioneering dancers and teachers Jamila and Suhaila Salimpour have also played pivotal roles in Janelle’s journey. Like Suhaila, Janelle studied ballet, tap and jazz from an early age, and integrates her classical training with Middle Eastern and Arabic dance. Suhaila serves as a mentor to Janelle, and the Salimpour theory and technique strongly influences her teaching style, which incorporates the history, culture and teaching methods handed down by the Salimpour legacy. A long-time student of Suhaila, Janelle became level 4 certified in the Suhaila Salimpour format (2017) and is level 2 certified in the Jamila format (2014). She performs with Bal Anat, founded by Jamila in 1968 and rekindled by Suhaila in 1999. Janelle is now Group leader and Choreography captian for the NEW Santa Cruz Salimpour Collective. Janelle continues to train with Suhaila, working toward her level Suhaila Salimpour level 5 certification and Jamila Salimpour level 3 certification.